Chess is a game of strategy: smart moves and a winning result. 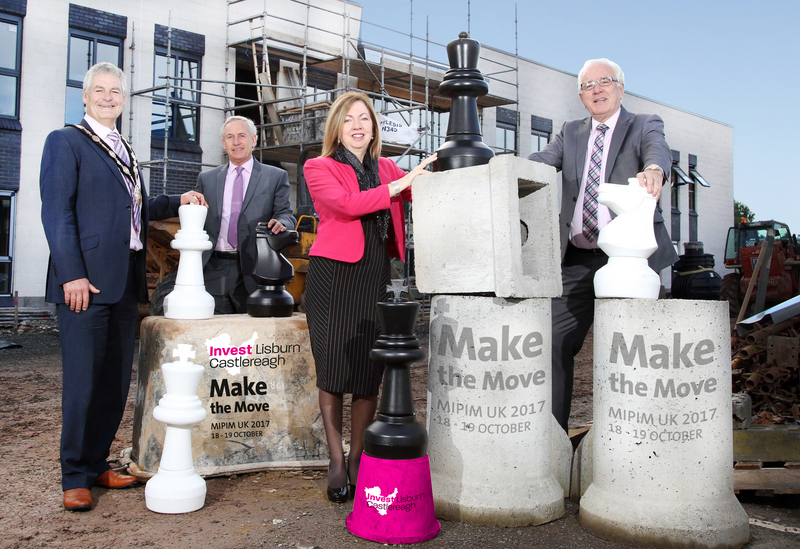 Investing in Lisburn Castlereagh is no different. Lisburn & Castlereagh City Council will return to MIPIM UK to demonstrate why the area is one to watch when it comes to investment and development opportunities. Is it time for you to ‘Make the Move’? For us it is all about location. Only 8 miles southwest of Belfast City Centre with direct motorway access Lisburn Castlereagh is strategically located on two key transport corridors; north-south and east-west. Our ideal location means we have the perfect all-island base with easy access to both the UK and EU markets. Post-Brexit this will place us in a very unique and advantageous position. With a tailored package of support for investors along with the proposed reduction in corporation tax to 12.5% and planning authority we are certainly ahead of the game. Visiting one of the latest developments in the Council area Chairman of the Council’s Development Committee, Alderman Allan Ewart, MBE, said: “We are delighted to return to MIPIM UK to demonstrate our commitment to growing our local economy through investment. With a designated area of 264 hectares across a number of locations zoned for employment this substantial land reserve has significant potential for future developments and the wider public interest.